Discussion in 'Bugs' started by DarkBowser007, Jan 26, 2014. I crouched as Dark Pit with the missiles and noticed I could still fire them. I can also fire them upward. Not sure if this is Classic powerup system only though. ThomasMink, Mitewing and MissingNo2 like this. I crouched as Dark Pit with the missiles and noticed I could still fire them. I can also fire them upward. Not sure if this is Classic powerup system though. 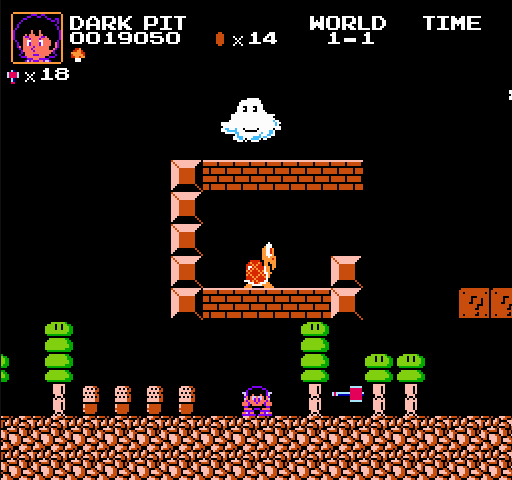 The real question is could Pit use the Hammer while crouching in Kid Icarus. Probably not, but it's worth looking into it. My current save is in a castle, I'll get back to you. EDIT: He can't. He also can't use it when looking up. Keep in mind the Pit in SMBC is a Samus skin, not the Pit character. ThomasMink, Korby and Faruga like this. Even with that in mind it just looks strange. I'd like to add normal samus can't shoot missles while ducking, she always stands up.